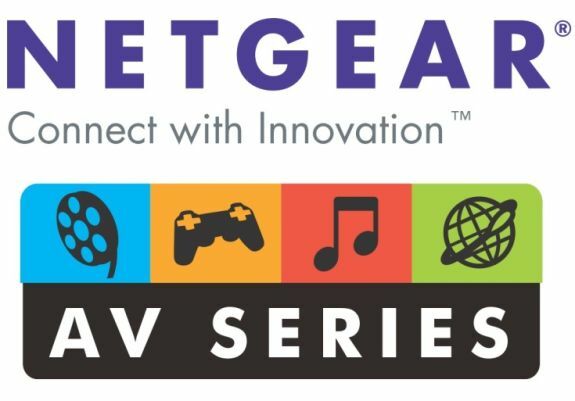 The first half of 2010 saw Netgear get started on their AV Series product line. Their intent was to create a set of products to enhance the consumer's home theater experience. The first few products appeared to be just rebranded versions of already existing units. A case in point is the WNDR3700 802.11n Gigabit router which was rebadged as the WNDR37AV a couple of months back. Rebadged products never generate much enthusiasm, even though Netgear may claim them to be designed with superior performance and features aimed at the home theater market. With Netgear's strength in the networking space, it is no surprise that all the products announced in the AV series so far have been aimed at making sure that the components of a home theater can talk in a satisfactory manner with the Internet, as well as the other components in the home network. However, can any home theater product line ever be complete without a media streamer? 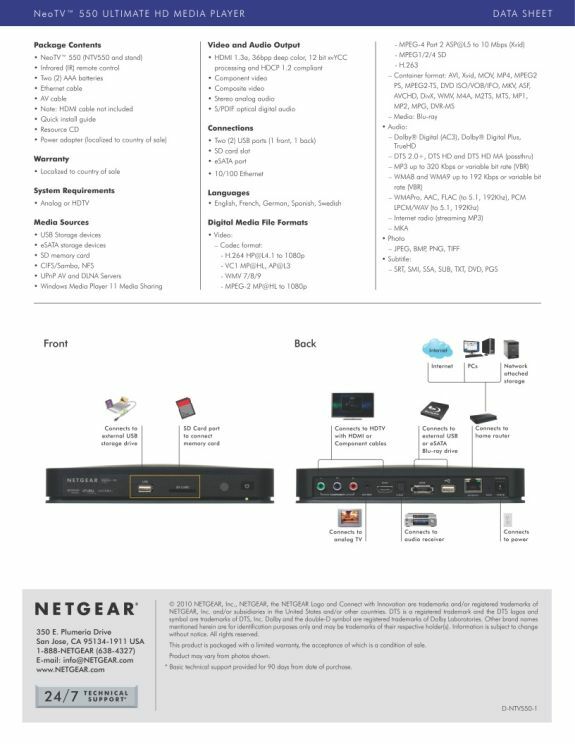 Is there any networking methodology (short of running Cat6 cables all over the house) reliable enough for streaming the highest quality Blu-Ray videos? All this is set to change in the coming months, though. 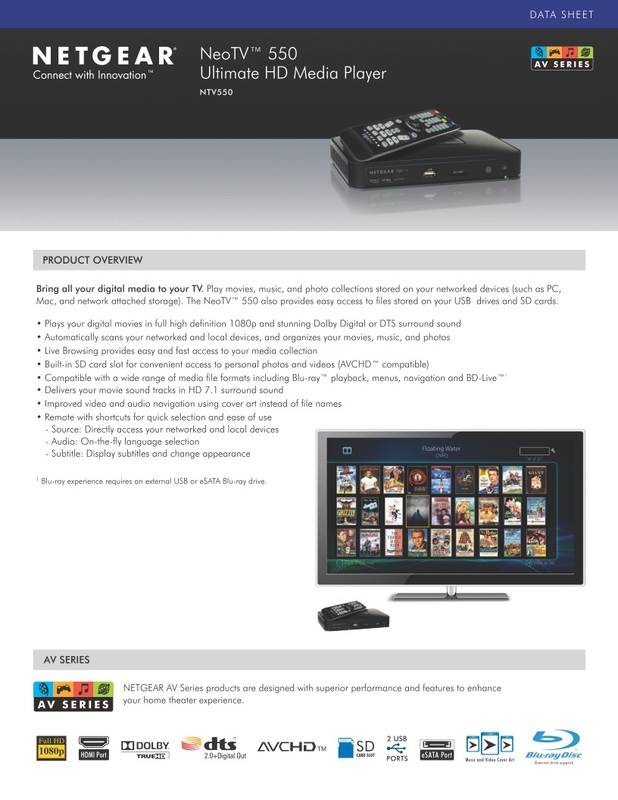 Netgear is slated to bring out a slew of press releases for the upcoming products towards the end of August 2010. In typical AnandTech fashion, we have the official scoop on the details which you are unlikely to find in the press releases. NeoTV is slated to fill the missing media streamer space in Netgear's AV Series cupboard. Two models are planned, the NTV350 and NTV550. The US market will only see the NTV550, while the European and Australian markets will see both the NTV350 and NTV550. The NTV350 model meant for the non-US market has the same internal feature specifications as that of the WDTV Live (the remote is the same). It is apparently based on a Realtek chipset [Update: Netgear just confirmed that it is based on the RTL 1073]. In this news piece, we will talk about the NTV 550 in detail. The manufacturer's description is provided in the two scans below, for your initial perusal. Netgear has been made aware of the need for commitment to firmware development when dealing with support for the vaguely spec-ed MKV container. 'Advanced' MKV features such as HD audio and PGS subtitle streams are currently being investigated to ensure proper implementation in time for the release. The NTV550 is expected to be available for purchase in October 2010 and will be sold at a suggested retail price of US $219.99 (we would really like it to be at a $199.99 price point). Media streamers at comparable prices bring in a slot for an internal hard drive and/or built-in Wireless-N support. The NTV550 has neither, but the Blu-Ray license accounts for the missing features, while maintaining the cost. If you have any further questions prior to the product release, feel free to put them in the comments, and we will get the answers for you. The other exciting product we are looking forward to is the Powerline AV 500 Adapter Kit (XAVB5001). It was announced at the 2010 CeBit, but we are closer to shipping now, and have more details about the internal chipset. 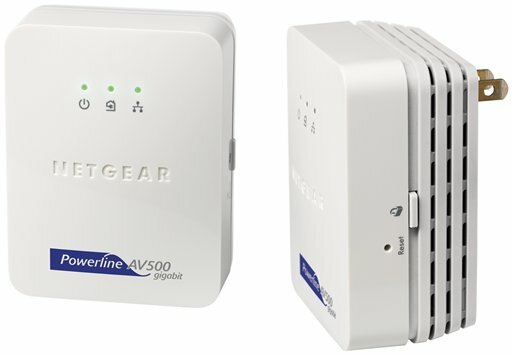 Just yesterday, we talked about the Atheros 7400 chipset in the review of the WD Livewire, and now we have official confirmation that the AR7400 is indeed powering the whole Netgear AV 500 powerline product line. Netgear was the first to use Intellon's 6400/1400 chipset with the 200 Mbps PHY, and they now seem to have got first dibs with the 7400 chipset also. Netgear claims that the 500 Mbps PHY is getting them 200 - 250 Mbps in the labs. This should result in a real world throughput of at least 100 Mbps. This is more than enough for reliable streaming of a single Blu-Ray stream at its maximum specified bitrate of 54 Mbps (Wouldn't it be nice to see HomePlug AV's claim of being 'HD streaming capable' come true at last?). The Powerline AV 500 Kit (XAVB5001) is slated to hit shelves in late October for a suggested retail price of US $159. AnandTech will receive the review units in October, and as usual, you can look forward to a really thorough review. If you would like to see anything tested in particular in the media streamer reviews or the powerline adapter reviews, do let us know in your comments. We will definitely revamp our powerline adapter benchmarking methodology, as it is not often that one gets to test out a new generation product in this space. ...and there I was about to buy a Play!ON HD mini. I hope you guys do a really good review of media streamers once this comes out. I actually just bought a Playon! HD mini, and so far it has been really great. A little more tweaking of the firmware and I think it will be absolutely perfect (for me at least). There is a thread on AVSForums showing Popbox (using SMP 8643) with a 10/100 port streaming Blu-Ray ISOs without any issues from a NAS. Agreed - the only Fail is the original posts understanding of technology. Not necessarily. With GigE also comes jumbo frames, reducing the number of interrupts. Also, 9k frame sizes are better suited to sequential streaming of large files. That said, 100 Mbps is fast enough to move a 4 GB file (ie. 2 hour MPEG2 DVD movie) in about 7 minutes. Far faster than is needed for streaming / playing files from an NFS share. Even Blu-Ray only requires 54 Mbps. I just bought the Viewsonic NexTV VMP75 and moved my Netgear Homeplug HDX101 from my daughter's room to my living room. I'm getting FAR less bandwidth there than I was in her room (less than half). Too little to stream HD reliably (30-50Mbps). The other outlet plug goes to my power conditioner into which all my devices (including a 50" plasma) are plugged into. I connected a TB external drive via eSata to the VMP75 and it plays HD beautifully. Unfortunately I only get ~5Mbps transfer rates when copying files to it from an XP machine. I noticed at one point this went up to 15Mbps when all the A/V components were off. Does the power draw on the Homeplug's twin outlet affect throughput? I've been thinking of trying to move it to a different outlet. I tried running Ethernet in the house... bought a fish tape and 500' of cat5e cable with connectors and all, climbed up into the attic heat of a Florida home with roofing nails clawing at my every move, and gave up when I realized that there were cross-braces between joists in the wall impeding my efforts. I tried an alternate outlet and immediately the Tx and Rx rates reported by the HDX101 configuration utility jumped to over 100Mbps. I thought I had a solution. But over the next few minutes, those numbers came down to around 50Mbps. (WTF?) That was last evening. Now they're hovering around 60Mbps. The "Quality" reading has jumped from "Data" to "DVD Video", but still a far cry from "HD Video". Any ideas why the initial reading was so high and then degraded from there?